If you are new to iPhone and not sure how to connect iPhone to wireless network, then you have come to right place. It’s easy to be done with just a few clicks on the phone. Once you have successfully connected iPhone to public wireless network at restaurant, cafe, library, airport or other locations, you will then be able to use it connecting to your favorite websites, do online chatting, email checking or perform other Internet access activities. You can get all these online activities done without relying on mobile network connection on iPhone. 1)Tap Settings icon on Home screen of iPhone. 2) After that tap on Wi-Fi icon. 3) Proceed to select the wireless network you wish to connect under Choose a Network… section. You will be prompted to key in wireless encryption key if that is secured wireless network (the one with padlock icon). 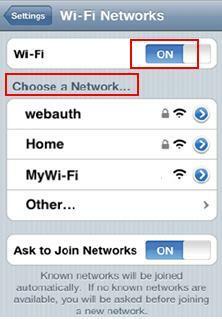 Note: Make sure the Wi-Fi feature of iPhone is ON too. Note: You can also select Other… to manually key in wireless network name and encryption key as needed. 4) At last, wireless signal logo will appear on the top left of the iPhone screen if it’s connected to wireless network successfully. You can then launch your web browser to access to different websites. Return to top of "How to Connect iPhone to Wireless Network"! !